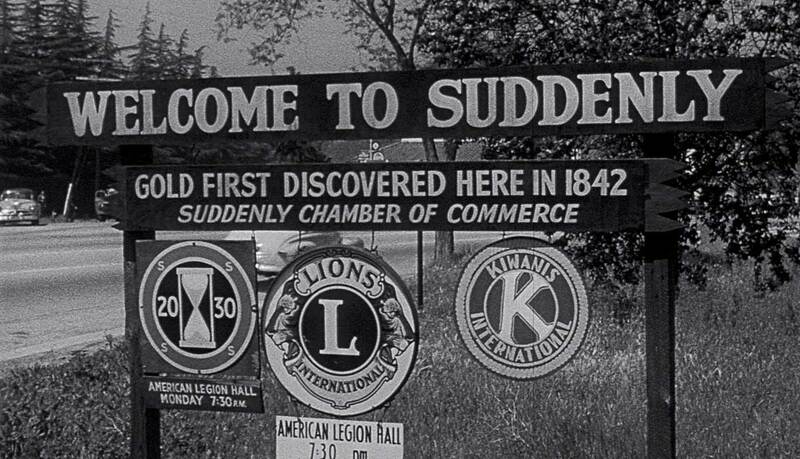 Suddenly is a sleepy little 1950s town that’s a stand-in for any kind of sleepy little 1950s town in the U.S.A. Not much happens in Suddenly, to the point where residents seem a little bored with life, enough to feel either half-awake or, combustible. The sheriff is Tod Shaw (the great, sometimes brilliant Sterling Hayden – likable and commanding, and just a little wonderfully off, he often appears to know more than what he’s letting on, or grappling with things far more existential than we may realize), whose feelings for widowed Ellen Benson (Nancy Gates) are laid out there for God and everyone to see. He simply tells her he’s in love with her. He’s also gone way too far by buying her son, Pidge (Kim Charney), a cap pistol, entirely against her wishes. He’s attempting to push his views on her about boys growing into men and understanding when violence is necessary, when he may need to defend himself, that kind of thing. “You can’t wrap the boy in cellophane.” He urges. A pacifist, she’s not buying any of this, but Tod persists: “When a house is on fire everybody has to help put it out. Because the next time it might be your house!” These officers of the law are practically willing what will happen. What will happen, and, soon, is the aforementioned skinny blue-eyed psycho showing up in his impeccable fedora with his thugs, posing as the FBI. It’s a big day in Suddenly among those who know – the President of the United States is riding through on train, stopping off to take a car to his destination – a fishing vacation. Ellen and her father, retired secret service agent, “Pop” Benson (James Gleason) are busy in their house, arguing about how to raise Pidge (Pop thinks she’s overprotective and lectures her, morbidly: “There’s cruelty and hatred and tyranny in the world. You can’t make believe they aren’t there. And Pidge has got to learn what is the law and what isn’t the law so he can defend it.”). Another typical day in the Benson house – working on the broken television set and arguing about Pidge’s exposure to the vicious, malevolent world (side note: the television set will become an instrument of violence). And now, this is the second man in Ellen’s life to practically summon the fedora-wearing psycho, John Baron (Frank Sinatra) to invade their home and prove their point. The Benson house is situated in a place with a terrific vantage point to see the president disembark from the train, and we’ll soon learn that Baron has been hired to assassinate the president (For whom? He doesn’t know and he doesn’t care, he just cares about money. He also enjoys killing). And, so, things get really dark, really fast. 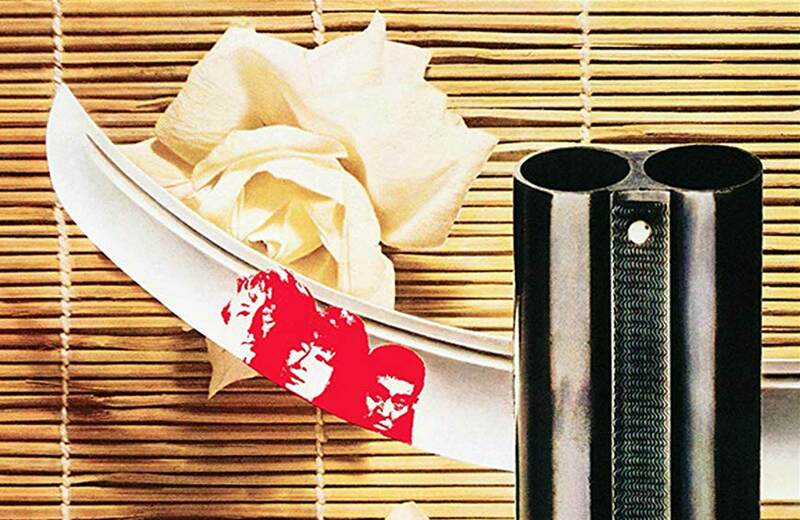 After Tod happily drops in with Dan Carney (Willis Bouchey), who is leading the secret service team deployed in Suddenly (Carney used to work with Pop – he wants to say hello), Baron breaks his cover and kills Carney. He injures Tod’s arm and threatens to murder Pidge. He then takes everyone hostage. At this point, well, I think Pidge has now had his exposure to violence. Tod? Pop? Is that enough for you? But it’s not going to stop there. 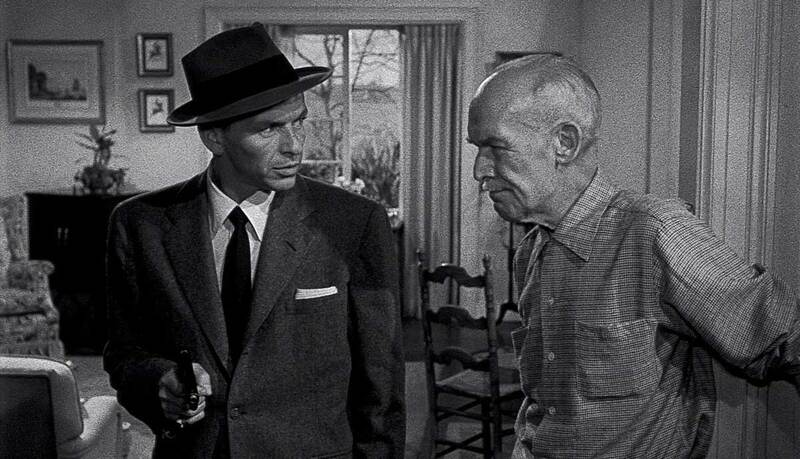 Directed by Lewis Allen, Suddenly is a tense and claustrophobic, and sometimes strange experience (and sometimes questionable – there’s a lot to wonder why Baron wouldn’t just kill everyone right away but, apparently, he enjoys an audience) with a crazy-eyed, grinning Frank Sinatra taking over the movie. It’s a powerful, enthralling performance, one of Sinatra’s best (he really should have played more villains), in which the character’s Napoleon complex insecurities (and bad upbringing – his parents were both drunks) are on full display, weakening him with his need to talk. Creeps like him often need to talk and brag and undo themselves and Hayden’s sheriff smells it the moment Sinatra starts gabbing. Unlike other domestic hostage movies, such as The Desperate Hours or He Ran All the Way, in which Humphrey Bogart has his own kind of appeal and John Garfield is attractive and downright sympathetic, there’s nothing attractive about this guy (aside from Sinatra just looking cool and beautifully tailored), and, even with his hard childhood, there’s very little that’s sympathetic either. Allen knew that Sinatra would be the center of this picture, not the leading man, but the star, and he lights him and shoots him (alongside cinematographer Charles G. Clarke) with great care – all others staged to revolve around him. It’s an intriguing stylization, both real and dreamlike – Sinatra, much smaller and slighter than Sterling Hayden (which isn’t hard – Hayden was 6’5”), appears, at times, diminutive, all mad dog bark, but he’s got bite. Even if Hayden looks like he could just casually swipe one paw and bump him across the room, Sinatra remains threatening. Sinatra also steps up to the camera- right up to the lens, in fact – nearly looking into it – an unsettling, confessional act, almost breaking the fourth wall – it’s stagey but captivating almost as if he’s trying to take it the viewer hostage too (“It’s Frank’s world, we just live in it,” indeed). His nerviness, his suit, his hat (which he takes off maybe only once in the film – when he first enters the house, and then never removes) places a certain style, an big-city menace to the Norman Rockwell-esque America held hostage here – his very presence making the picture more cinematic. Around this time, movie director Allen was starting with his long career directing television (“Bonanza,” “The Rifleman,” “Route 66,” “Perry Mason,” “Mission: Impossible,” “The Detectives” and many, many more, though he was still making movies, A Bullet for Joey, Illegal, Another Time, Another Place and Whirlpool followed Suddenly), and you can see how well-suited he is for the medium. You also see his clear filmic talent and his staging skills, which he acquired in the theater – the place he started from (Suddenly feels adapted from a play even if it wasn’t). Englishman Allen transitioned into movies in the early 1940s, and in 1944 and he directed his first feature film, which is largely considered his greatest film and one of the greatest of the genre – the beautifully crafted and genuinely scary ghost story, The Uninvited. He made some comedies, but his strength, from what I’ve seen, was in suspense and melodrama. Two of his best pictures, for me, next to The Uninvited, are the blazing technicolor film noir, Desert Fury, starring Burt Lancaster, Lizabeth Scott and Mary Astor, and So Evil My Love, a gaslight noir featuring a wicked Ray Milland. Another dark, interesting picture is Appointment with Danger, starring Alan Ladd as a cynical U.S. Postal Inspector who spits misanthropic lines to a nun he’s protecting with almost comedic affect (“When a cop dies they don’t list it as heart failure, it’s a charley horse of the chest,” he says). Whatever drove the director (when discussing his career in a 1997 interview he said, “That was the way of the studios. You took whatever they gave you … From the time I came to Hollywood, I was never out of a job. The William Morris office treated me as one of their pet directors, and there was always a job for me. When they couldn’t get a movie for me, they got TV.”) he excelled in stories featuring seriously dysfunctional relationships, creating a tense, sometimes gorgeously atmospheric setting and getting some fine performances out of actors. 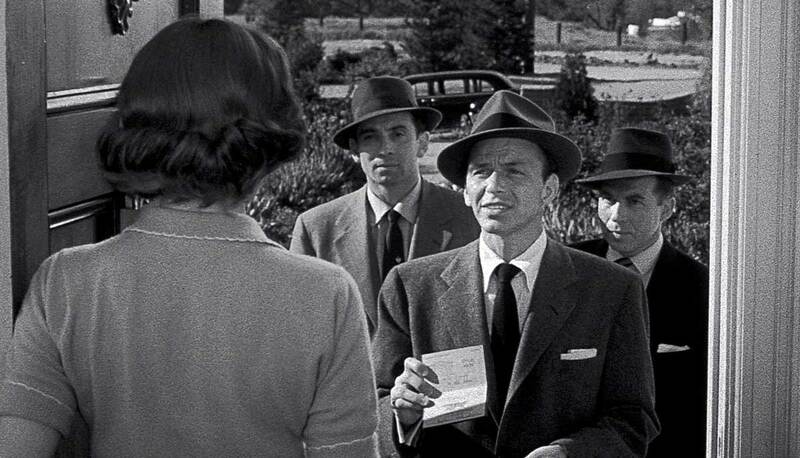 The aesthetics of Suddenly aren’t immediately evident – it could be described as nice-looking and workmanlike – but there are many compositions that are striking – any time Sinatra frames the window or just stands in the middle of the set – actors orbiting around him – the leanness of his scarred face. Remarkable. Suddenly falls in the more hard-boiled realm of Appointment with Danger or one of Allen’s later, lean and mean The Rifleman episodes, but it has traces of gaslight noir, even if unintentional, as the men here are all incredibly manipulative towards Ellen (the poor woman hears enough about understanding violence from the sheriff and her pop, and even Sinatra, who at one point, dares her to shoot him with his gun – knowing she won’t… until she has to). I don’t think that Allen bought the artificial gee-willikers attitude of the town, making the darkness presented here fascinating in terms of Eisenhower America. Though people discussed such things in the 50s and some movies discussed gun violence (like George Stevens’ Shane), the characters are having the kind of arguments one would hear more openly in the 1960s – about pacifism and duty towards your country. That kind of talk makes Ellen, in this world, a traitor, possibly even a communist. Pop admonishes her peace talk so much that he says her deceased husband would be “ashamed” of her. Jesus, Pop. Ease up. But of course, the movie ends with a confirmation of everything the men are telling Ellen: That violence is indeed sometimes necessary, even inevitable in life. OK, got it. However, this is where Sinatra’s WWII psycho war veteran – who states that he loves to kill people and that the war gave him that opportunity – acts as a counterbalance. A natural born murderer who, in one discussion with Hayden (who also served), weighs in on how it’s legal to murder for your country, but not in civilian life. 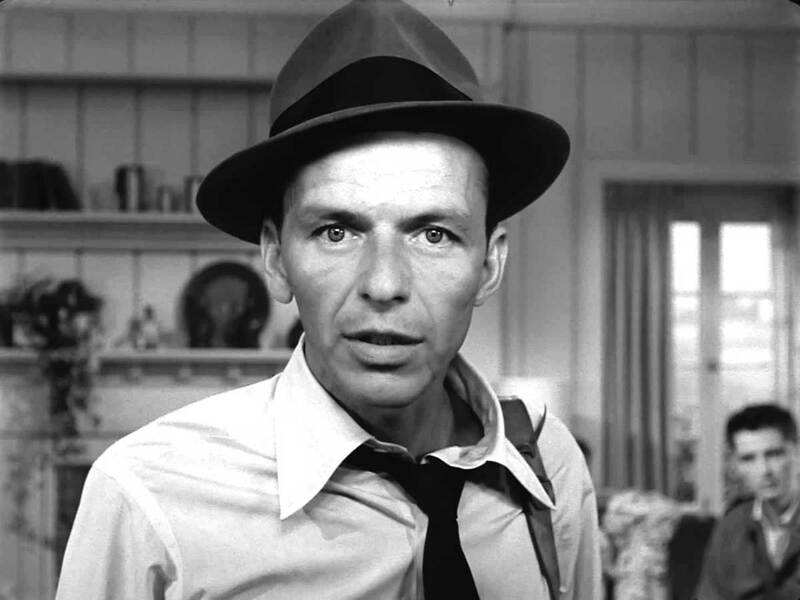 Sinatra’s character presents an either intentional or accidental rebuke to the necessity of violence; the acceptance of it. A man who is drunk on violence, who feels like a god with a gun, who has set up a high-powered sniper rifle to kill the president (Is he possibly working for the communists? The movie never says but you feel red scare paranoia laced within all of this). There’s no telling that her heroism hasn’t traumatized her for life. Still. It’s not only Ellen that saves everyone, it is Pidge pulling a toy gun switch with the gun Pop has hidden in his drawer (everyone’s so used to that cap gun that Sinatra doesn’t notice) – and that will turn the tables on the villain too. The comfort of 1950s Americana – mom, the television set and the normalcy of a toy gun – that’s what brings down the attempted assassination of the president. Since the movie will, later, be viewed with a likely apocryphal story attached – that Sinatra, so upset by the assassination of his friend John F. Kennedy, had this picture withdrawn after he learned Lee Harvey Oswald watched the movie before he killed the president (Sinatra also starred in another plot to assassinate the president – John Frankenheimer’s The Manchurian Candidate) – it carries a darkness with it that the filmmakers and stars could not have foreseen, even if none of this is likely true. By the end, order is apparently restored: Ellen is softer on Sheriff Tod (they kiss and promise to go to Church), Tod is less frustrated over Ellen and little Pidge will surely get more of his way regarding toy weaponry. Well OK. After all that horror. So … is this a happy ending? I’m sure it’s supposed to be, and if you are pro-gun, you may love that Ellen has supposedly seen the wrongs of her anti-gun ways (I don’t love that – I want Ellen to keep fighting for her beliefs – she’s admirable up against all of these men hollering at her). 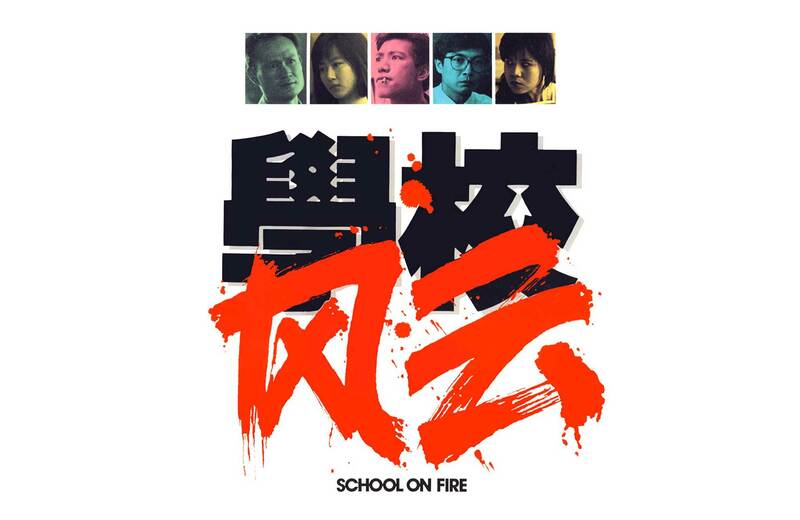 But nevertheless, the entertaining movie sticks with you and makes you think, even beyond its more direct message. Is there something more ambiguous here? I wonder. And, so, after a massive body count, answering the near invocations of the men around her, the town seems to have earned its name back. Funny name for a town, says a motorist, prompting Sterling Hayden to answer: Oh, I don’t know about that.